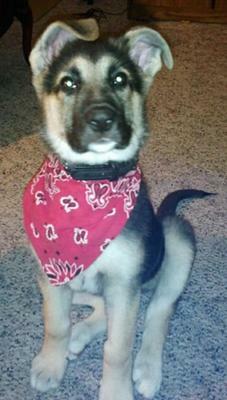 My name is Ryan and attached is a picture of my 3 mo old Female GSD Kaia. Kaia is a very intelligent puppy who has been working very close with the Illinois Search and Rescue Team doing puppy trails and working towards field work (man-trailing) as a hobby. What a pretty little girl Kaia is! Great that she is working with a rescue team, hopefully she will help in a rescue and become someone's Hero. Take care of your girl Kaia and she will take care of you!